We are going to be at the CEV Continental Cup Beach Volleyball tournament in Baden from the 10-12th June. There you will be able to meet us and also see some of the stars of beach volleyball. We are not just bringing our beautiful faces we are helping spread the word about one of our great friends TriVolle. Any of you that joined us at the MOVE – Movember launch party last year, will know that this was the opening act of the night. It is a great game, a mix between beach volleyball, four square (not the check-in startup, a school yard game from the US). As you can see from the video…stop, watch it now. Now as you can see from the video, this is an amazing game and one that takes 10 mins to get it to it and 5 mins to get addicted. That was not a mistake. Why should we do that you are asking, well, we talked with the TriVolle team and negotiated a fantastic deal for you all. Be the coolest kid this summer and get one of these Trivolle sets for an amazing price, only available through One Player Down. Anyone who has started their own venture knows there are many false dawns, things are done wrong, promises are made & broken, but everything/day is a learning process. That is as true a statement you will ever hear in your professional career. Startups as most things in live can be looked at as a puzzle where you are charged with finding all the pieces that fit. Confidently we can say that we have found another massive piece of the OPD puzzle and it was Jakub Strama shaped. The breath of fresh air that he has brought to the team has been fantastic! To be honest, though there were a lot of things going on behind the scene, One Player Down was in somewhat of a holding pattern as the adjustments to the “other” founder roles (fatherhood) that both Matthias and Nick were experiencing were beginning to take their toll. Now with Jakub, fresh perspectives and more hands on deck we are all able to consentrate on what we do best or can learn quickest. This means there will be more updates, changes etc to the platform soon. Of course we are working though the fantastic amount of feedback we have gotten with a priority list but we are always up for more feedback. Just send the feedback/feature requests to support@oneplayerdown.com and we will work it into future releases. Young entrepenure motivational tip: Read the book Rosie Revere, Engineer for inspiration to keep dreaming, this book is all about how to keep dreaming and trying as success is just around the corner. 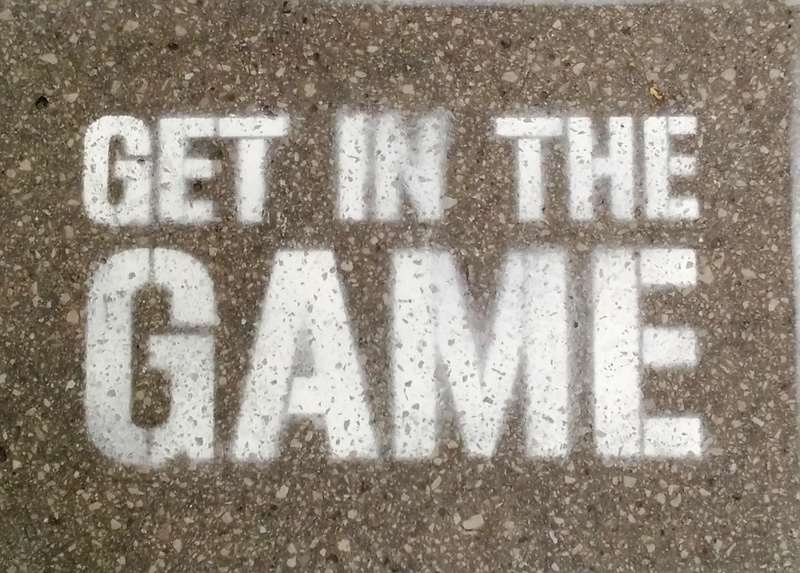 Remember to sign up and join the sports socializing revolution that we are building. Obviously these are not the only sports jobs available around the globe at the minute, it is just a small selection. If there are any jobs that you hear about that you feel should be featured here please email us at support@oneplayerdown.com and we will post it in the next edition. Please feel free to pass this around to your friends and contacts if you feel there is a job that might interest them. In the future we will also feature jobs at One Player Down but in the meantime, if you are interested in working with us please just contact us as we are always looking for more members of the team to take this platform to the masses. 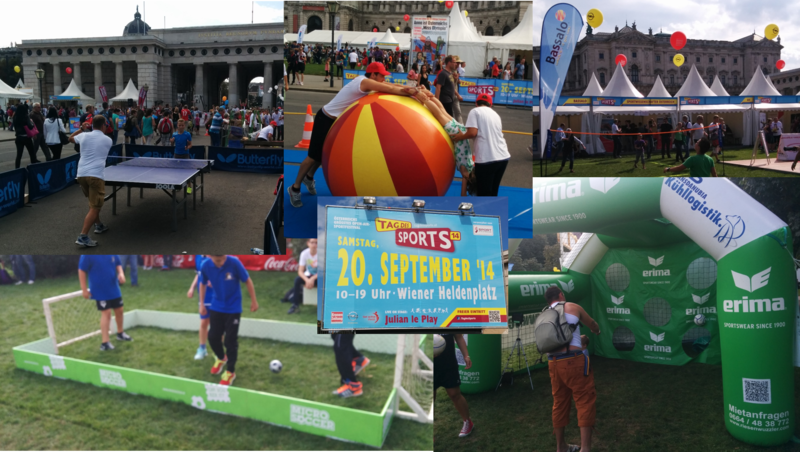 Saturday saw Vienna host another successful Tag des Sport. With the weather also “playing ball”, it was a great event, allowing thousands of people to test out sports that they might have only seen on TV, or heard about. It also gave unknown (at least to One Player Down) sports find new fans by showing how fun and easy they are to access. The typical sports were attracting the most people, but it was sports such as Bassalo, Faustball, Mini Squash and Prellball that caught our eye. Bassalo is a very simple game that involves throwing a ball using a cup across a net to the other player, the scoring was not clear but the guess is the one who drops it loses. It was not just the simplicity of the concept, it was the diversity of ages that tried them that we loved seeing. Mini Squash is really self explanatary, squash but mini. Here it was plazed with a foam ball, closer to a tennis ball in size and with bigger raquets. Prellball, is again similar to Volleyball in set up and thus very similar to Faustball, as the ball is allowed to bounce but it is played on a court the size of an indoor volleyball court. All very interesting and there were a lot more sports on show as well. Looking forward to next year where hopefully One Player Down will have a booth and you will get to meet the whole team. That is a bit of a bad title for people trying to start something in Vienna but this is a post that needs to be written. Pick-up games live and die on the availability of cheap – read free- facilities – that are available to the masses. Basketball in Vienna is great as there are a lot of places in and around the city, Beach volleyball too, skating has a lot of places as well. Then we come to “the beautiful game”, the one that every bar in the city made sure that every patron was able to see a TV for fear of losing customers, Football, Soccer, Fußball, fotbol whatever you call it. This is not really catered to in the city at all. Yes there is cage football available but that is not as in demand as playing on grass, jumpers for goal posts and joy of playing on grass. 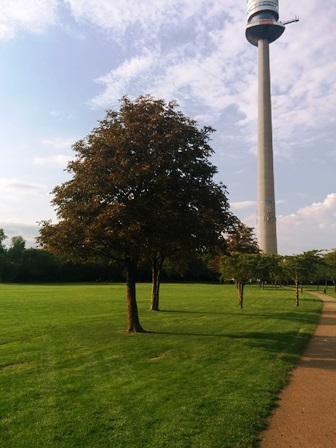 Prater or Donauinsel are built for picnics, to play football there is to risk serious injury. In London from the moment work, school or university finishes on a weekday in the summer, the parks are filled with people of various skill levels playing. By the end of the summer the ground though hard as a rock and as bald as Bruce Willis after a hair cut it is still flat. That is the thing that separates these parks from Prater or Donauinsel; flat, level, even surfaces. There are no sinkholes, craters etc where the ball or even a smaller player might disappear down. 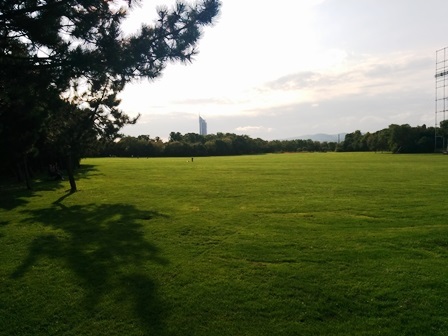 It is time that this park was used for the good of Football, it is really the un appreciated gem of Vienna and hopefully the saviour of Monday night football. If you are interested in Monday night football or more games organized in DonauPark just register at One Player Down to find out more or to create your own. Qu’est-ce qu’une Sports Network socialisation (Sports Socializing Network)? Une des questions qui nous sont posées le plus souvent est ce qui est un Sports Network Socialiser exactement, et comment est-il différent d’un un réseau social Sports Network Social, Sports Network ou. Bien qu’il existe des similitudes et des chevauchements, il y a de grandes différences entre les trois derniers et un Sports Network socialisation. D’abord, permettez-moi de définir ce que les trois autres sont. mieux connu comme Facebook, Twitter, Snapchat … C’est là que vous restez avec vos amis et ce qu’ils font en général, avoir des enfants, de sortir dans les bars, à partir de nouveaux loisirs, le sport, le soutien d’équipes, aimer nouvelles entreprises … la liste est sans fin. C’est 90% du temps une activité passive, mais idéal pour garder en place avec les venues sur des amis partout dans le monde. ESPN est un réseau des sports, ils offrent la possibilité de regarder et de découvrir les sports majeurs qui se déroulent dans le monde entier. Tombe Sky Sports dans cette catégorie car il offre les mêmes, mais seulement avec un accent différent. En général, cela est une activité passive. Sportslosbster, L’Equipe et même des choses comme TeamTalk pourraient tomber dans cette gamme. Bien que ceux-ci sont très bien, et utilisé par l’équipe de One Player vers le bas, ils ont tendance à se concentrer sur un derrière utilisateurs d’ordinateurs, pas les gens qui participent à des sports, les gars! Donc, une fois encore, il est une activité passive, montrant le soutien d’une équipe et de discuter avec les fans comme esprit d’un sport / équipe que vous aimez. Il est un peu hybride du réseau Sports Network et sociales. Nous arrivons maintenant à la Socialisation Sports Network (Sports Socializing Network) … Il est seul dans le monde et vous l’avez deviné, vous lisez le blog de ​​la seule et unique sport socialisation réseau, il est – One Player Down. Nous ne sommes pas sur les guerriers du clavier passifs ou les fans de ce sport, nous sommes sur les personnes influentes, ceux qui veulent obtenir dans le jeu. Nous sommes une “transpiration n’est pas une option” plate-forme, pour vous aider à rencontrer de nouvelles personnes, de rester actif et d’organiser des jeux / équipes / ligues avec le minimum d’effort. Étant un fan est très amusant, mais étant un joueur … qui est juste mieux. Le niveau de compétence n’est pas un problème, le jeu est le nom de la partie. ¿Qué es una Red Deportiva Socializadora (Sports Socializing Network)? Una de las preguntas que nos realizan más a menudo es qué es una Red Deportiva Socializadora (Sports Socializing Network) exactamente y en qué se diferencia de una Red Social (Social Network), de una Red Deportiva (Sports Network) o de una Red Social Deportiva(Sports Social Network). Aunque hay similitudes y coincidencias, existen grandes diferencias entre las tres últimas y una RedDeportiva Socializadora. En primer lugar permítanme definir lo que son las otras tres. Mejor conocida como Facebook, Twitter, Snapchat… Aquí es donde usted mantiene contacto con sus amigos y lo que hacen en general, tener hijos, salir de copas, empezar nuevas aficiones, hacer deporte, apoyar a equipos, el gusto por nuevas empresas … la lista es interminable. El 90 % del tiempo se trata de una actividad pasiva, pero es genial para mantenerse al día con lo que les pasa a los amigos por todo el mundo. ESPN es una Red Deportiva, ofrecen la oportunidad de ver y descubrir los principales deportes que se practican por todo el mundo. Sky Sports entra en esta categoría, ya que ofrece lo mismo, pero sólo con un acento diferente. En general se trata de una actividad pasiva. Sportslosbster, Marca e incluso cosas como TeamTalk podrían entrar en esta gama. Aunque estas son fantásticas, y utilizadas por el equipo de One Player Down, tienden a centrarse en usuarios detrás de un ordenador, no en las personas que participan en los deportes, chicos!. Así que una vez más se trata de una actividad pasiva, mostrando el apoyo a un equipo y discutiendo como aficionados afines sobre un deporte/equipo al que amas. De alguna forma es un híbrido entre la Red Social y la Red Deportiva. Ahora llegamos a la Red Deportiva Socializadora (Sports Socializing Network)… Sólo hay una en el mundo y lo has adivinado, está leyendo el blog de ​​la única Red Deportiva Socializadora que existe – One Player Down. No vamos de pasivos guerreros del teclado o aficionados del deporte, somos los que se mueven y agitan, los que quieren entrar en el juego. Somos una plataforma cuyo lema es “sudar no es opcional “, que te ayuda a conocer gente nueva, mantenerte activo y organizar juegos/equipos/ligas con el mínimo esfuerzo. Ser un aficionado es muy divertido, pero ser un jugador… es simplemente mejor. El nivel de habilidad no es un problema, jugar es el nombre del juego. Entonces, ¿a qué estás esperando? Entra en el juego.